Thoughts on reaching half a century of issues of MTI; that it's the 'inspirational layout that gets us going and the continued support of the subscribers is encouraging. A scenic and systematically operated American HO shortline, the JFRR. A 12ft x 2ft layout set in western Montana. Chris Ellis, Jack Chipperfield, Ian Bareham, Carl Arendt, Jack Trollope and John Allison write about layouts that have influenced and inspired them. An overview of layouts through the years the author has seen, remembered and liked. 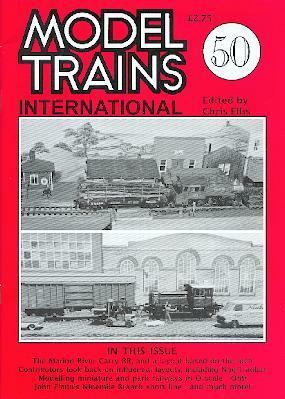 Ideas for modelling miniature railways (derived from MTI39) in 7mm scale describing conversion of locos and stock. Layout idea The shortest short line? The Marion River Carry Railroad - a real life line in upstate New York less than a mile long, with only one point. Drawing and advice on building a little modelled British lineside feature. US based Inglenook using Ikea shelves as a baseboard. built to bring operating fun into the author's life! 80x28cm.